I am writing this post from the opponent’s turf. I am spending my spring break in Miami, and the Nationals just arrived in town last night too to start a series against the Marlins. The series in Atlanta this weekend wasn’t very good. The Nationals got swept and Gio got clobbered on Sunday. That isn’t what you want to see in a series against your big rivals, or even against your smallest rivals. I also don’t like to see Ryan Zimmernan go down for 4-6 weeks with a broken thumb, especially after he was VERY close to going on the DL last week for his shoulder but had a solid week this one. The Face of the Franchise shouldn’t be going down this early in the season. After being beaten by the Braves, the Nationals are lucky to not to have to face them again until June 19. So let’s talk about the games this week. The Nationals are playing in a popular state that is split into 2 time zones, about 4 big cities, sunny beaches, and spots for kids and adults alike to either high-five Mickey Mouse or put a parrot on your shoulder. The Miami Heat of the NBA are really good, but the rest of the Miami teams are not. Look at last season: Miami Dolphins (7-9), Florida Panthers (15-27), and most importantly,the Miami Marlins (62-100). Miami baseball fans are crazy about Jose Fernandez, last year’s Rookie of the Year. Marlins Park fills up the days he pitches. 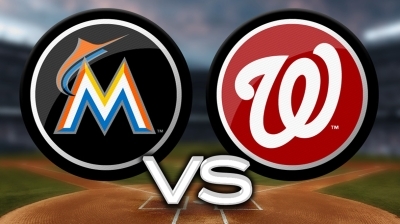 The Nationals will play a three game series in Miami this week, facing Brad Hand today, Tom Koehler on Tuesday, and the series ends in a game I will be going to, which is Tanner Roark vs. Jose Fernandez. The Marlins’ pitching will possibly be a danger this week. But when the starters run out of gas, their weakness comes into play. The bullpen of Miami has only Steve Cishek at the rear of the ‘pen to show for, and the rest aren’t that good. For example, Mike Dunn gave up Danny Espinosa and Bryce Harper monster bombs on 8/4/12 and gave up a solo, go-ahead shot to Chase Utley yesterday. 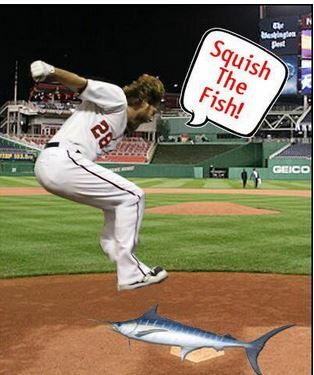 Arquimedes Caminero gave up a grand salami to Ian Desmond on Wednesday last week, and Carlos Marmol gave up a grand slam to Jayson Werth the day before. Dan Jennings earned the loss this Saturday vs. Philadelphia. I think the Nats will take 2 out of 3, with Jose Fernandez beating Roark on Wednesday, which sadly is the game I will be at. I still have hope, though! Look for me on the MASN HD broadcast.